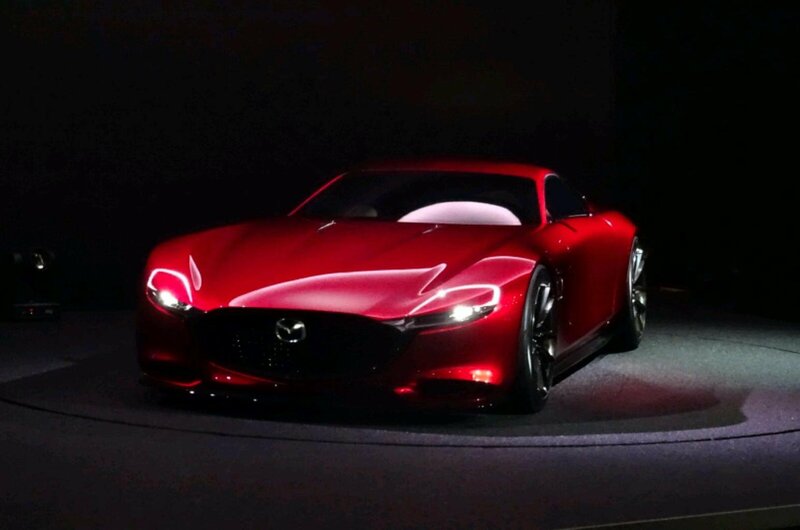 Mazda RX-Vision concept previews return of rotary engines | What Car? The Mazda RX-Vision concept car shows the company’s intention to bring a new rotary-engined sports car to market. The concept has been shown at the 2015 Tokyo motor show. The coupe is a two-door, two-seat sports car, and it is 4389mm long, 1925mm wide, with a height of 1160mm and a wheelbase of 2700mm. Those dimensions make it marginally longer and wider than Jaguar’s F-Type coupé sports car, and significantly lower. The two-door, two-seat coupé is described as being "Mazda’s vision for the ultimate in front-engine, rear-wheel-drive sports car styling," and is said to represent "a vision for the future that harbours the soul of the Mazda brand." The concept’s design is said to offer "a sense of lineage and authenticity, encapsulating Mazda’s entire history of sports car design." Following Mazda’s KODO design language, the RX-Vision’s low body features short overhangs at either end, with a low roofline and low bonnet – something made possible by the compact dimensions of the SkyActiv-R engine. Inside, the concept features handcrafted components with intricate instrumentation, leather trim and a simplistic instrument panel. The concept has 245/40R20 tyres at the front, and 285/35R20 rubber at the rear. According to Mazda, the SkyActiv-R rotary engine solves the three main issues with previous rotary units: fuel economy, emissions and reliability. The firm has not yet announced precise power outputs or specifications. The company confirmed that the technology is not only going to be used in production cars, but that it is intended to be entertaining. "We've sought to make cars that are a pleasure to drive, and we will continue to provide customers with these cars," said company boss Masamichi Kogai. "One day rotary will make a comeback. This gives form to our brand's vision of the future. It expresses our intention to make rotary. There are many issues to overcome but we will continue efforts. We're working steadily. Keep your eyes on Mazda." The Japanese manufacturer killed off its last rotary-engined sports car, the RX-8, back in 2012 as its motor faced ever-tightening emissions regulations. The firm built a prototype turbocharged RX-8, but that car would have failed to meet European requirements, and its further development could not be justified on Japanese sales alone.